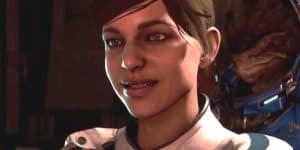 Mass Effect: Andromeda's Animation Gains Response From BioWare | Nerd Much? Though Mass Effect: Andromeda is only a day away from release, it’s been under a lot of heavy fire for the animation issues in Early Access. BioWare has already stated that there won’t be any patches to fix the problem, which implies that the issue is much deeper than a simple glitch in the software matrix. Since then, some fans have gone a little overboard and begun to not only threaten BioWare, but to direct their discontent at facial animator Allie Rose Marie Leost. Do you think the attacks were justified? Is BioWare, EA, or neither in the wrong here? Comment below and let us know.